So there is e-book reader in your hands. How can I make it been a long and trouble-free? Here are a few recommendations. in order to your e-reader battery lasts longer and had maximum capacity, it need to conduct training. For this after purchasing the device not charge the battery as long as the e-book will not tell you that the battery is fully discharged. If possible - discharge it faster (if the book has a Wi-Fi switch it on and use the internet, start the games or just flip through the pages). The more frequently screen is refreshed - the faster battery discharged . After that you must charge the battery fully. After repeating the procedure of full discharge-charge twice, we thus reviving the chemical processes inside the battery, which could lie down for a long time before with the e-book on the shelves. Now you can chargeand not fully discharged battery. Screen devices for reading, made by technology E-ink is very fragile. It's top part, through which we can see the text, has made of transparent plastic. That is the display surface can be damaged bycontact with aggressive liquids: alcohol, acetone or other solvents. The bottom part of the screen has made of very thin glass. 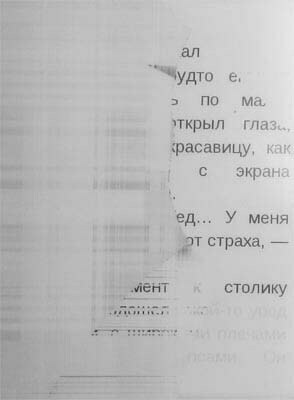 At pressing from above on the screen the substrate can burst, and the screen will be lost for ever (its cost is equal approximately to half of cost of the book). On the right you see a photo of the broken screen of e-book reader Pocketbook 360. Ha the screen divorces and a part of the remained image are visible, but cracks it is not visible. It occurs because at deformation the top film on the screen remains whole, and the bottom glass substrate bursts. means to wipe the screen follows a soft fabric, or a napkin. Very well for these purposes microfiber approaches. It is possible to moisten a napkin part a little with water and to wipe the screen at first a damp part, and then at once to wipe dry. There are situations when books cease to be loaded by the reader. Often it is connected with infringement of file structure of internal memory or a SD-card. As a rule, formatting of internal memory helps in this case Or cards. Here there are some subtleties. Internal memory of the electronic book can be formatted only through the menu of the book. To format through Means Windows such memory it is impossible. It can lead to death of the reader. The SD-card can be formatted means Microsoft Windows, but it is more reliable to do it by the special utility developed by Panasonic company.